Is GeoResonance on to something? 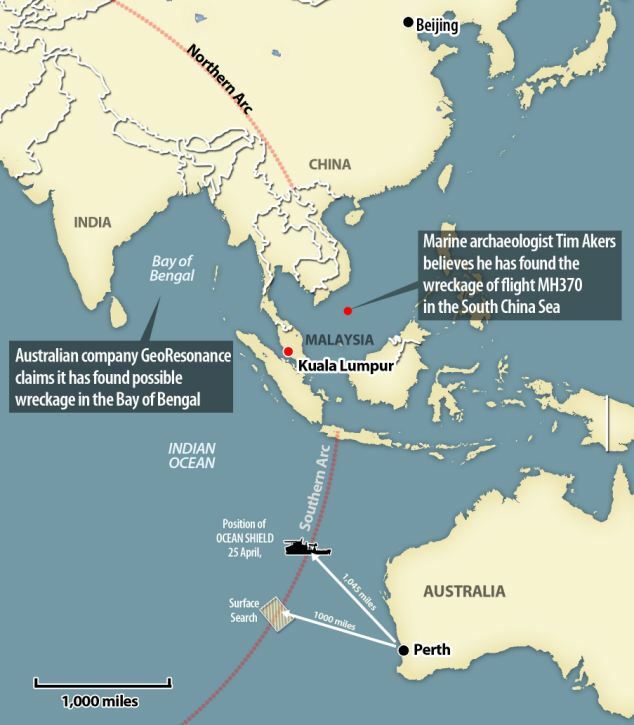 CNN) -- The Australian company GeoResonance claims it has found the wreckage of a plane in the Bay of Bengal. The company is not saying that what they found is missing Malaysia Airlines Flight 370, but it is urging official searchers to take a look. So far, Malaysian officials say they are investigating the credibility of the claim, while Australian searchers and a satellite company say they are confident that the plane is in a different area. Pope declined to give the precise coordinates for GeoResonance's find, but said it was about 120 miles (190 kilometers) south of Bangladesh in the Bay of Bengal. The search officials do have the exact location, he said. The current official search area is in the southern Indian Ocean, and is being coordinated by the Australians. The site where GeoResonance says it found the wreckage is several thousand miles away in an area that was ruled out weeks ago. Pope said his company began searching that area at a time when search efforts were in the Bay of Bengal. The search moved on, but his team sent their findings to officials repeatedly, he said. Did officials ignore the company's findings? According to GeoResonance, yes, its e-mails and phone calls to the official searchers went unanswered. That is one of the factors that pushed the company to release its findings publicly. Pope says he did not want to share the findings publicly at first, but it was possibly the only way to get heard. "We're a large group of scientists, and we were being ignored, and we thought we had a moral obligation to get our findings to the authorities," he said. The strategy appears to have worked, according to Pope. On the same day he released the findings, Malaysian officials reached out and listened to a 1½-hour technical presentation by his team. Malaysian acting Transportation Minister Hishammuddin Hussein said Malaysia "is working with its international partners to assess the credibility of this information." Australia's Joint Agency Coordination Centre, which is leading the multinational search, dismissed the claim. The officials are "satisfied" with data that show the plane likely is in the southern Indian Ocean, and not in the Bay of Bengal. Two ships – BNS Bangabandhu and BNS Anusandhan – began scouring the sea from Tuesday night, Navy Director (Intelligence) Commodore Rashid Ali told bdnews24.com on Wednesday. Geophysical survey company GeoResonance on Monday said it had spotted pieces of wreckage in the Bay of Bengal and that it should be investigated as potential debris from the Malaysian plane. The Joint Agency Coordination Centre (JACC), which is managing the multinational search, said it continued to believe that the plane had come down in the southern Indian Ocean off Australia. Bangladesh Navy resumed search operation after the media ran reports on the GeoResonance claim. The Navy’s two frigates and two maritime aircrafts had earlier scoured the Bay of Bengal, joining the multinational search, six days after the plane went missing. But after a 12-day-long search, they returned empty handed. Flight MH370, a Boeing 777, went off the radar while flying from Kuala Lumpur to Beijing on Mar 8 with 239 people on board. GeoResonance official David Pope had said that the technology they used was originally designed to find nuclear warheads, submarines. The company has surveyed over 2,000,000 square kilometres of the possible crash zone, using images obtained from satellites and aircrafts. Scientists focused their efforts north of the flight’s last known location, using over 20 technologies to analyse the data including a nuclear reactor, Pope said. He added they were “very excited” at finding what they believed to be the wreckage of a commercial airliner. Another official of the survey company, Pavel Kursa, said they had identified chemical elements and materials including aluminium, titanium, copper and steel alloys that make up a Boeing 777. The team sent an initial report to the authorities while the black box still had two weeks of battery power left. They said they verified the findings by analysing images from the same area on Mar 5, three days before the Malaysian plane’s disappearance. “The wreckage wasn’t there prior to the disappearance of MH370,” David Pope said. hose are two of the details outlined in a preliminary report by Malaysia’s Transportation Ministry released to the public Thursday. The report had been sent to the International Civil Aviation Organization, the U.N. body for global aviation. The attached preliminary report was drafted with the involvement of the NTSB, AAIB, ATSB, AAID and CAAC, as well as Malaysian officials. Malaysian authorities on Thursday released a report on the investigation into the disappearance of Flight 370, which revealed that air traffic controllers did not realize that the plane was missing until 17 minutes after it vanished from civilian radar. Since the Boeing 777 disappeared on March 8, the airline has been putting the relatives up in hotels, where they've been briefed on the search. But the airline said in a statement Thursday that it would close its family assistance centers around the world by May 7, and that the families should receive search updates from "the comfort of their own homes." The airline said that it would establish family support centers in Kuala Lumpur and Beijing, and that it would keep in close touch with the relatives through means including phone calls and meetings. But it’s unclear when that happened. The report makes no mention of the military’s role the night of the disappearance. Preliminary reports are by their nature brief and to the point. It is up to the country to choose whether to release additional details, such as a cargo manifest, seating plan and air traffic control transcripts. “This report and any other documents released should be an audit of what happened and factually who did what,” Quest said. Compared to the preliminary reports of other recent major flight investigations, the one released by Malaysia is scant. The equivalent preliminary report on Air France 447 was 128 pages long. That report by, produced by France’s aviation safety agency just one month after the plane went missing in 2009, offered specific details on communication between various air traffic control centers. Flight 447 was found more than a year later in the Atlantic Ocean; all 228 people on board had died. And a preliminary report by the Australian Transport Safety Bureau into the Qantas engine explosion in 2010 ran more than 40 pages, including diagrams and charts. The report released Thursday was the same one Malaysia submitted to the International Civil Aviation Organization but had not been made public. Malaysian officials came under heavy criticism last week for submitting the report to the U.N. body but not making it available to relatives of passengers. While authorities are not required to make a preliminary report public, Malaysian Prime Minister Najib Razak acquiesced. Reporters could not ask questions raised by the report since the document was released by e-mail and not at a news conference. SYDNEY—International aviation experts and investigators are planning to meet privately in Canberra next week in an attempt to further refine estimates on where Malaysia Airlines Flight 370 likely crashed, according to a person familiar with the investigation. The experts, including a panel of air-crash investigators put together by the Malaysian government and officials from Boeing Co. and Inmarsat PLC., will collectively examine closely-guarded military radar data as a well as other key pieces of information from the investigation to see if any new conclusions can be drawn, the person said. Their findings will be presented in a report that will be handed over to civilian contractors, whom officials hope will take over the search for the missing flight in the coming weeks, the person said. Governments and officials involved in the search have so far remained coy about the use of sensitive military intelligence to look for Flight 370. But as private companies prepare to enter the operation for the first time, more signs are emerging that military radar from multiple countries has played a key role in the search for weeks. The person close to the matter said that Malaysia brokered an agreement between U.S. air-crash investigators and neighboring Asian countries in late March to allow for military radar to be discreetly shared with investigators. The unique sharing arrangement involved Malaysia convincing regional neighbors to hand over military radar data to the U.S.’s National Transportation Safety Board that could then be analyzed by Boeing, the U.S.-based manufacturer of the missing 777-200 passenger aircraft, the person said. Boeing used the primary radar data to determine that the plane had traveled faster during the early part of its flight near Malaysia, which combined with aircraft performance models showed Flight 370 burned through fuel quicker and likely crashed into the sea earlier. The sharing agreement happened shortly after the international panel of air-crash investigators was brought together by the Malaysian government on March 24. Malaysian and U.S. officials have not publicly acknowledged the agreement. Military radar data has been critical to determining Flight 370′s movements because the plane’s transponder and ACARS flight tracking system were incapacitated shortly after it took off from Kuala Lumpur bound for Beijing with 239 people on board on March 8. Boeing’s calculations using the military radar were combined with Inmarsat satellite data to help determine the current search area where Australian navy vessel Ocean Shield detected transmissions consistent with black boxes in early April. Malaysia, Thailand, Singapore, Indonesia, China and India all have early warning radar systems in the region, including primary radar bases on land that track targets without asking for permission, and specialist aircraft that can ascend to higher altitudes to see further beyond the horizon using radar detection equipment. China’s Ganbala radar station on a snow covered mountain in Tibet, at almost 3 miles high, can also see further than many other low altitude bases. Early in the search Malaysia made requests to 15 nations for radar data, including China, Thailand and Indonesia. Thailand eventually admitted it may have detected Flight 370 on its radar systems, but other nations like Indonesia publicly denied they had picked up any sightings. The planned meeting in Canberra next week follows a statement by Australia’s Prime Minister Tony Abbott on Monday that experts needed to “reconsider exactly what they think is the most likely probable impact zone based on the data that we’ve got,” after more than 50 days of fruitless searching for the plane. Australia has recommended a number of civilian contractors to the Malaysian government for consideration as candidates to take over the search from regional militaries, as air force and navy assets from eight countries exit the Indian Ocean search, Australia’s Defense Minister David Johnston told The Wall Street Journal. According to the report, a playback of a recording from military primary radar revealed that an aircraft that may have been MH370 had made a westerly turn, crossing Peninsular Malaysia. Air-traffic controllers spent precious time in the early hours of March 8 after Malaysia Airlines Flight 370 veered off its flight path in befuddled exchanges with counterparts in nearby countries, newly released documents show. It appears that Malaysia knew from the get go that MH370 did not go down on the flight path from Malaysia to China. Is it any wonder that the relatives of passengers/crew are so mistrusting of the Malaysian Prime Minister. I empathize with them when I attempt to imagine one of my family members on that flight. I have many questions as to why this info was withheld for so long while the Malaysian government and media only reported on the massive search in the South China Sea that was taking place. The CNN panel is doing a great job of answering many of those questions ... especially Richard Quest. South China Sea? Bay of Bengal? South Indian Ocean? A British marine archaeologist claims he has located wreckage from missing flight MH370 by using advanced home-made technology. Timothy Akers, 56, apparently located a portion of the doomed Malaysia Airlines plane's tailfin while scouring an area off the coast of Vietnam. For his amateur sleuthing, Akers takes images harvested from Nasa's Landsat 7 satellite and uses homemade software to expose them to different parts of the light spectrum. This creates a deep field of vision which enables him to peer up to 10,000 feet below the waves. So far no physical wreckage has been found of the missing Malaysia Airlines plane, which took off from Kuala Lumpar on 8 March. Speaking about what his enhanced images show, Akers, who lives in North Yorkshire, said: "There's no question it could be anything else, because aircraft parts are very distinctive. "Having seen the oil rig worker's report of the crash and Nasa's satellite images of the area, it would seem strange the Malaysian authorities have dismissed the area out of hand. "Logically they should have checked it out by aircraft at low altitude and by a surface warship, but it looks like they chose not to. That in itself is very odd. "Fortunately the water there is shallow as it's on the continental shelve and there will be debris all over the sea floor." The area identified by Akers tallies with an account given by Vietmanese oil-rig workers, who said they saw a burning plane plummeting from the sky. But the authorities in Malaysia leading the search for MH370 have seemingly discounted the possibility because the location Akers has identified is 1,000 miles from the present search zone. Akers reckons that MH370 crashed into the South China Sea and not the Southern Ocean, as is generally thought. The amateur investigator has some pedigree in martine detection which means his claim should not be dismissed out of hand. In 2008, the wreck of a ship named HMAS Sydney was located in the same area as that identified by Akers two years previously. Beijing (CNN) -- Relatives of vanished Malaysia Airlines Flight 370 passengers wailed and yelled in a Beijing hotel Thursday as the airline announced it was closing the assistance centers where they'd been gathered for weeks -- effectively telling the families to go home. The closures also will mean no more mass daily briefings for the relatives -- news that sparked a new wave of anguish and despair for the hundreds who heard it at Beijing's Lido Hotel. If MH370 is located in the Gulf of Thailand or the Bay of Bengal ... Inmarsat will have a lot of explaining to the families ... to the world regarding the timeline. Inquiring minds will want to know if Inmarsat "experts" in satellite analysis were part of a cover up meant to assure that this plane was never recovered while at the same time convincing the families ... convincing the world that MH370 and it's passengers/crew were at the bottom of the South Indian Ocean? The following is a April 9, 2014 preliminary report that was released today. Apparently it leaves many unanswered questions for the families of MH370 passengers/crew. Mystery continues to surround the fate of Malaysia Airlines flight MH370, which disappeared en route from Kuala Lumpur to Beijing on 8 March. Malaysian authorities, assisted by international aviation and satellite experts, are now battling to piece together the plane's final hours in the hope that they can find its wreckage and explain what happened to its 239 passengers and crew. Some preliminary details were released on 1 May in a short report. What time did the plane disappear? 00:41, 8 March: Malaysia Airlines Flight MH370 departed from Kuala Lumpur International Airport on Saturday, 8 March (16:41 GMT, 7 March), and was due to arrive in Beijing at 06:30 (22:30 GMT). Malaysia Airlines says the plane lost contact less than an hour after takeoff. No distress signal or message was sent. 01:07: The plane sent its last ACARS transmission - a service that allows computers aboard the plane to "talk" to computers on the ground. Some time afterwards, it was silenced and the expected 01:37 transmission was not sent. 01:19: The last communication between the plane and Malaysian air traffic control took place about 12 minutes later. At first, the airline said initial investigations revealed the co-pilot had said "All right, good night". However, Malaysian authorities later confirmed the last words heard from the plane, spoken either by the pilot or co-pilot, were in fact "Good night Malaysian three seven zero". A few minutes later, the plane's transponder, which communicates with ground radar, was shut down as the aircraft crossed from Malaysian air traffic control into Vietnamese airspace over the South China Sea. In maps accompanying its 1 May report, the Malaysian government revised the time to be 02:22 and put the position further west. 08:11: (00:11 GMT, 8 March) Seven hours after contact with air traffic control was lost, a satellite above the Indian Ocean picked up data from the plane in the form of an automatic "handshake" between the aircraft and a ground station. This information, disclosed a week after the plane's disappearance, suggested the jet was in one of two flight corridors, one stretching north between Thailand and Kazakhstan, the other south between Indonesia and the southern Indian Ocean. 08:19: There is some evidence of a further "partial handshake" at this time between the plane and a ground station but experts are still working on analysing this data, the Malaysian transport minister said on 25 March. 09:15: (01:15 GMT) This would have been the next scheduled automatic contact between the ground station and the plane but there was no response from the aircraft. The plane's planned route would have taken it north-eastwards, over Cambodia and Vietnam, and the initial search focused on the South China Sea, south of Vietnam's Ca Mau peninsula. But evidence from a military radar, revealed later, suggested the plane had suddenly changed from its northerly course to head west. So the search, involving dozens of ships and planes, then switched to the sea west of Malaysia. Further evidence revealed on Saturday 15 March by the Malaysian Prime Minister Najib Razak suggested the jet was deliberately diverted by someone on board about an hour after takeoff. After MH370's last communication with a satellite was disclosed, a week after the plane's disappearance, the search was expanded dramatically to nearly three million square miles, from Kazakhstan in the north to vast areas of the remote southern Indian Ocean. Then, on 20 March, Australian search teams revealed they were investigating two objects spotted on satellite images in the southern Indian Ocean and sent long-range surveillance planes to the area, followed by further sightings. An Australian ship arrived in the area and further vessels are on their way. At 1400 GMT on 24 March the Malaysian prime minister announced that following further analysis of satellite data it was beyond doubt that the plane had gone down in this part of the ocean. This was based on Inmarsat and UK air accident investigators' analysis of the data relayed between the plane and ground station by satellite. More potential debris was spotted by satellites but on 28 March the main search area was moved 1,100km (684 miles) to the north-east and closer to Australia, following further analysis of the speed of the plane and its maximum range. Malaysian officials said that the debris could still be consistent with the new search area as ocean currents may have moved floating objects. However, no debris has yet been verified as being from the plane. On 5-8 April, Australian and Chinese vessels using underwater listening equipment detected ultrasonic signals from the plane's black box flight recorders, in what appears to be the most promised lead so far. KUALA LUMPUR: Nothing has so far, been found in the Bay of Bengal, with regard to a report by an Australian exploration company that it might have located the wreckage of the missing Malaysia Airlines (MAS) MH370 aircraft. Joint Action Coordination Centre (JACC) Chief Coordinator Angus Houston said currently, three Bangladeshi navy ships were scouring the area, with one of the ships equipped with echo sound capability to assist in ensuring a thorough search in that particular area. Maybe the Bluefin-21 could assist in the current search effort in the Bay of Bengal. The autonomous underwater vehicle (AUV) Bluefin-21 Friday completed mission 18 in search for missing Malaysia Airlines flight MH370, the Joint Agency Coordination Centre (JACC) said. The ship Ocean Shield is now en route to Fleet Base West to replenish supplies and personnel and will then return to the vicinity of its current search area for search operation with the Bluefin-21, according to the JACC. Malaysian authorities said they were still considering probing a theory that the missing Malaysian airliner MH370 may be in the Bay of Bengal. Acting transport Minister Hishammuddin Hussein said that Malaysia had not decided whether to hire private deep sea vessels to search waters of Bay of Bengal as that would distract resources from the main search operation in the southern Indian Ocean. "That lead can only be confirmed by physically getting appropriate vessels to search that area. But I just want to stress that by doing that, we are distracting ourselves from the main search," he said. "In the event that the search result is negative, who is responsible for the loss of time? Having more vessels out there (Bay of Bengal) would affect the search in the affected area," he added. Malaysia, Australia and China will meet in Canberra to discuss the next steps in the search for Malaysia Airlines Flight 370, as officials expressed confidence in finding the missing jet. An Australian-led multinational search in the southern Indian Ocean hasn’t found the missing jet. A U.S. Navy submersible is currently scouring the seabed off Australia’s west coast where investigators believe the Beijing-bound plane crashed. Australia Air Chief Marshal Angus Houston, who is heading the search, said the upcoming meeting would seek to formalize “the way ahead to ensure that the search continues with urgency,” as the operation could take eight to 12 months. “We’re totally committed as three nations to find MH370 and I’m confident that with an effective search, we will eventually find the aircraft,” he said in a press conference with Mr. Hishammuddin.